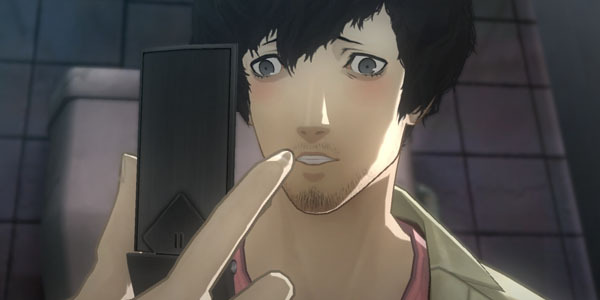 Atlus has released new screenshots, artwork and character bios for its upcoming love-triangle thriller Catherine, set to release on PlayStation 3 and Xbox 360 this summer. We’ve pretty much seen everything in today’s shots – a seductive Catherine, a worried Vincent and a bossy Katherine – but this time they’re in English. Check them out at the gallery. Character descriptions of the three can be read below. The seductive beauty who suddenly appears to Vincent. This startling seductress steps into Vincent’s life from out of nowhere and immediately throws his relationship with Katherine in jeopardy. Her coquettish charm grabs a hold of Vincent’s heart, even as her free spirit and potent sexuality grab a hold of… other parts of his mind and body. Without warning, everything in Vincent’s life becomes twisted around Catherine. Vincent’s girlfriend, who wants something more. Katherine is a loyal and steadfast girlfriend. She works for a clothing company. She and Vincent were classmates in high school, but they only started dating after they met again at their 10-year reunion. She has begun to think more and more about their relationship, and wants him to fully commit to her. His indecisiveness is beginning to annoy her more and more as time goes by. An indecisive bachelor who gets swept away by the actions of the two women in his life. Vincent is a lifelong bachelor trying to escape the pressures of adult life: his job, his love life, the prospect of marriage… His seeming goal is drift aimlessly through life. While his girlfriend Katherine wants him to settle down and marry her, he still wants the freedom of the single life. After meeting the enigmatic beauty, Catherine, his life is dragged into a waking and sleeping nightmare.